Yesterday, in the neighbourhood of Jabel Mukaber in Jerusalem, a court order to evict squatters who had taken over a house was carried out. Such events of course take place every day, all over the world, and rarely make the headlines as international news. But in this case the house in question had been found, after a lengthy legal process, to belong to Jews, the squatters happened to be Arabs and the event took place in a city which many foreign commentators appear to believe that modern egalitarian principles opposing racist differentiation should not apply. The Guardian’s Jerusalem correspondent, Harriet Sherwood, was quick to arrive on the scene and file her report of the events in which nameless, faceless Jews are described only in one form of terminology. The question which springs to mind, of course, is how would Harriet Sherwood describe an Arab family who bought a house and moved into a predominantly Jewish neighborhood of Jerusalem? Would they be described as ‘settlers’ too? Earlier today I spoke to Mr. Yair Gabai, a member of the Jerusalem City Council, who pointed out that the number of Arab families living in mainly Jewish areas of the city is actually considerably greater than the number of Jewish families living in predominantly Arab neighborhoods of Jerusalem. “Jerusalem is an open city” he said, explaining that the City Council is committed to principles of democracy, free market activity and title to property. “No person should be subject to limitations when buying a place to live with his own money”. Indeed, one hopes and presumes that Harriet Sherwood and the Guardian would find the idea that someone should be prevented because of their race from buying property in a specific part of London or New York extremely offensive. It is therefore highly incongruous that in Jerusalem, and only in Jerusalem, the idea of racist differentiations between Jewish buyers and Arab buyers should be seen by “the world’s leading liberal voice”, as the Guardian likes to describe itself, as being a progressive stance. This, however, did not prevent her from dedicating the body of her article to unsubstantiated allegations from assorted politically motivated sources and interested parties and, as she so frequently does, adding for good measure her own interpretation of “international law”. As a liberal and a progressive, maybe Sherwood should devote a little more time to considering the fact that the eastern portion of Jerusalem was captured in 1948 and later annexed by Jordan in a move that was not recognized by the international community (except for Britain and Pakistan) and as a result of which the Jewish residents of that part of the city were actively driven out, denied access to their property and holy sites and the city artificially divided for 19 years. Having done that, maybe she could also consider which scenario is more worthy of her progressive support: one in which all residents of the city have the right to live wherever they choose and worship freely – as is currently the case – or one in which certain people would be barred from living in particular areas simply on the basis of their race. I know which scenario I think deserves the support of a true liberal and progressive, and it is certainly not the one based on racist differentiation between Jews and Arabs. 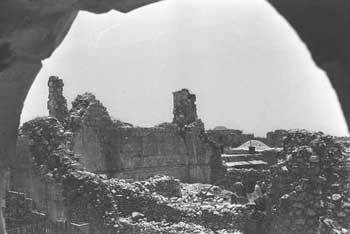 The historic Hurva synagogue, in the Old City, was reduced by the Jordanians to rubble after gaining control of "East" Jerusalem in 1949. It has subsequently been restored. Thanks for this, Israelinurse…I will be in Sde Nehemia and Jerusalem during the next 2 weeks and will follow this up with interest on the ground as it were. Wow-I had no idea Israelinurse was a one-stater. You should go easy on poor dear Harriet Sherwood, she is only a badly paid clueless stranger in Jerusalem, she has no idea about Jewish and Arab culture, society and history, she doesn’t speak Hebrew and/or Arabic, but she has to supply the right quantity of lies and distortions for her employer’s daily Hate the Jews sessions. There were times when important newspapers like the NYT sent T. Freedman to Israel – a ME scholar who spoke both Arabic and Hebrew. The Guardian can’t afford this professional level, but its readers don’t require it anyway. When Jews trys to prevent Arabs from moving into a Jewish neighborhood the world crys racism. When Jews try to move into an Arab neighborhood and the locals protest, the world crys racism (of the Jews ofcourse). Death threats for Arabs who sell homes to Jews is ofcourse not racist. And not any sort of Racism or double standard by the press. I can confirm Yair Gabai’s assertion that many Arabs live in Jewish neighborhoods in Jerusalem. There are Arabs living on my street in Jerusalem, one family lives about 40 yards away across the street cater-corner. From reading much of the Western [Brit and American] MSM, one might think that the Jews in Israel force the Arabs to live in tents and eat camel dung. In fact, many of the Arabs, like many of the Jews, are infatuated with consumer culture and shopping centers and the like. Here in Jerusalem, both Arabs and Jews have free rein to indulge this infatuation.